The big question on my mind after seeing this gameplay on the Nintendo Treehouse. (see clip below at end of article), is this, Will we North American fans get to enjoy the game the way it is intended? During the live play through at E3 (which is almost an hour long, and awesome by the way.) They had the creator (and his translator) in the room to describe the hard work that went into making this game. The thing that stood out to me was the difficulty they had in casting perfect voice actors. ALL of the actors do all their own singing in this game. ALL of the dances have been choreographed by real dance professionals, and that choreography is intended to match the Japanese vocals obviously. So here’s the thing, if they give us a dub, I can guarantee you that two things will be wrong with this game 1.) they won’t be professionally trained voice actors AND singers (they’ll be one or the other, and given that Atlus is a small company, probably unknown voice talent, with little to no singing experience. 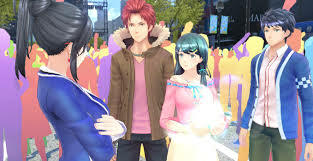 HOWEVER, this may NOT be the end of the world, because similar games, by similar very small teams such as Lunar by Working Designs, had professional talent such as O-Town (I am pretty sure this was before he joined O-Town or became famous), and even other characters such as Luna and Lucia who were just Voice Actresses, and not trained musicians sang beautifully. So I’m not as worried about that as I am about the choreography. We will be missing out, having mis-matched dance movements. Okay so that may be a minor thing to some people, but it’s supposedly like the main focus and selling point of this game. Atlus has never given us the option to play with Japanese audio in Persona or SMT before…. So things don’t look good here for fans wanting to experience the original game. I think it’s sad because SO much effort is going into the music of this game. Really a shame. Maybe Atlus will surprise us and translate everything except for the music scenes? 🙂 That’d be a happy compromise I think. This is purely speculation and opinion. And it doesn’t change how excited I am for this game! Also Atlus has another musical RPG called Rhapsody a musical adventure, and the English singing while, uhm not professional quality, was actually pretty catchy and addictive! I was REALLY disappointed when it was ported to handheld (by another company I think?) and the option for english vocals completely removed, it actually kinda ruined the game for me, and I don’t even like dubs lol. Also in the original Rhapsody Atlus DID give us the ability to play the game with Japanese vocals and english subtitles. Will they do that again since music features so prominently in this game? Let’s Hope! Meanwhile, here’s the Nintendo Treehouse footage for those of you who missed it.